What is your biggest sales problem or opportunity? For many, it is renewing customers. Returning customers should be your biggest source of business. A decade ago, print publishers generally could easily renew about 70% of their business each year, so they needed 30% new business to stay even. Sales growth required sufficient new business to replace the advertisers who didn’t return, and then some. In the second decade of the twenty-first century a 50% renewal rate for print advertisers might be good. Half of those advertisers who thought advertising with you last year was a good idea have probably decided against it this year. No wonder business is declining for so many magazines. Old habits of selling a campaign, then circling back the next quarter or next year during “planning” aren’t enough. And one of the most interesting differences between print advertising sales, and other kinds of sales, is that in every issue you publish a list of sales leads for your competition. The very act of launching a campaign brings competitive challenge to the renewal you want, and need, in order to thrive. Break a new advertiser, and as soon as their campaign is launched with you, all your competitors will be calling that advertiser to tell them there is a better place to spend their money. It is not just the competitors that are your problem, but your client – the advertising director, or marketing manager or media buyer – most likely all three – will be given advice by co-workers, friends or even by family members about where they should advertise. Everyone feels like they are an expert on advertising these days. The President of the $10-million or $100-million company will be told where he should be advertising by his friends at the golf club, or spouse over dinner. These decision makers or influencers may begin to have their doubts. How can you improve your chances for renewal of your advertisers? Delivering results would be an easy answer. But for most advertising you sell there is too long between the advertising exposure and the purchase to draw a line from dollar out to dollar in. 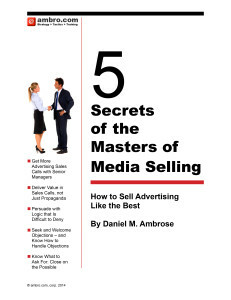 Successful advertising builds awareness and interest and trust that results in sales. But sometimes that advertising influences one person who influences another person to make a purchase. Then it becomes even more difficult to connect expenditures to results. So pointing out how the advertising can work for the customer, by reminding them of the ripple effect they have started that will result in future sales, is a good place to start. When is the right time to do the re-selling? Most sales people and sales managers would say when the advertisers are ready to plan their next year is a good time to recap their decision and history. But at ambro.com we know that the most valuable time to re-sell is immediately upon the purchase, right when all the competitors are about to call, and right when the clients are most open to a sales pitch. They recently agreed to make a purchase, but it might have been 30 to 90 days ago, so remind them why it was a good decision before they suffer from buyers remorse. Give them reasons, and data if you have it, to brush off all the comments from competitors or disgruntled internal voices who might be saying, “you should have done this or that.” Their sales-pitch guard is down now: They just want to feel good about their decision, so a sophisticated Thank-You Note is the solution. What is a sophisticated Thank-You Note? First of all, it’s personal. Second, it contains more than just “Thank You:” It includes reasons or data that remind the buyer why they made a good decision. And third, it doesn’t go to just one contact, but many. I know it is old-fashioned, but a formal business letter of thanks and reinforcement, addressed to your key buyer and “carbon copied” to his or her key colleagues will go a long way. Remember, people are more interested in reading other people’s mail then reading their own, so those “cc’s” will be a way for you to get a really effective communication to the President of the company, the head of sales, the Media Director; whomever is in the constellation of influencers around your key point of contact in the sales process. “Thank You” is a powerful and underused phrase. Put “Thank-You-Power” to work for your franchise. Make “Thank Yous” a regular part of your personal sales schedule, or encourage your sales people to do it. Even better, hire ambro.com to conduct a sales skills development program and include “Thank Yous” as part of the curriculum.